Power management vendor Eaton claims to have invented a new “pay as you grow” UPS system that will save data centres a fortune on capital expenditure and electricity bills. 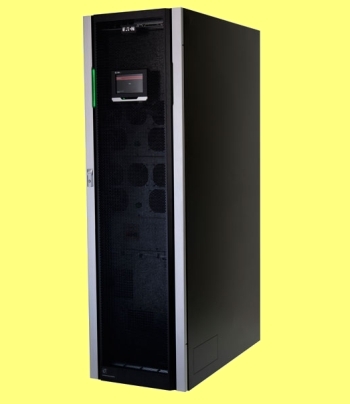 Its new 93PM product family is a modular range of uninterruptible power supplies (UPSs) for small to medium data centres. Eaton claimed the modularity and power management features will allow customers to build data centres by increments. It said the modules have been designed to work more efficiently together, in a process that cuts the traditional leakage problem that arises when UPSs are run below their capacity. Jorma Mannerkoski, Eaton’s sales vice president for Northern Europe, said smaller data centres regard buying a UPS as a high-risk, long-term commitment in a commercial environment where even the short term is hard to predict. This confusion has cause a blockage in UPS purchases. Eaton claims to have smashed that blockage after spending 18 months developing modules that can be aggregated without sacrificing efficiency. Unless UPSs are run at full capacity they waste electricity, he said, but nobody ever figured out a way to supply just enough UPS capacity to meet the customer’s immediate needs. “Previously if you had excess UPS capacity the load would be spread across the units. The lower the load, the less efficiently they run,” explained Mannerkoski. Eaton said it has solved this problem by designing a system that allows one unit to run at near full capacity and the other to go into sleep mode. “The new system pushed the UPS up the efficiency curve,” Mannerkoski claimed. Eaton’s Intelligent Power Manger (IPM) software is supplied as standard and integrates with major virtualisation platforms including Vware vCenter, Microsoft Systems Center and Citrix Xencenter.